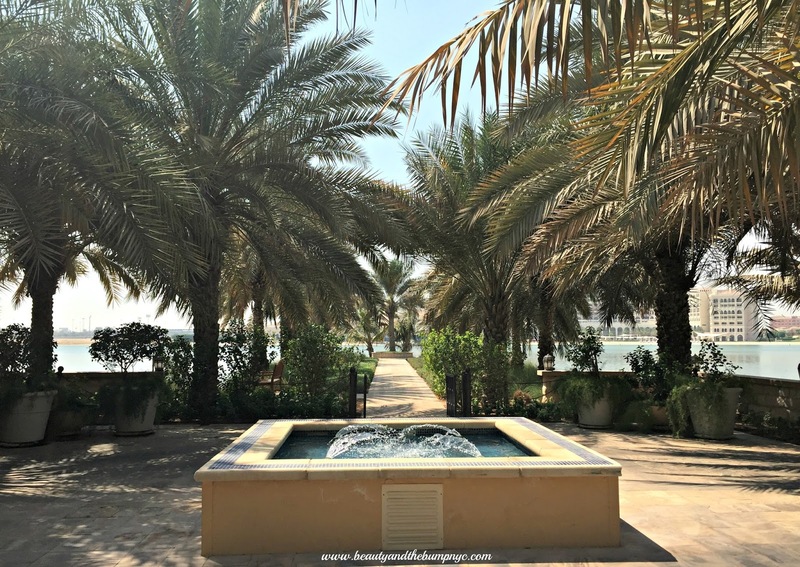 The Shangri-La Qaryat Al Beri Residences, a 21-acre luxury complex situated between the between the Souk (mall/market) and Traders Hotel in Abu Dhabi, is where my husband, daughter and I spent four nights and three days during our visit to the United Arab Emirates. 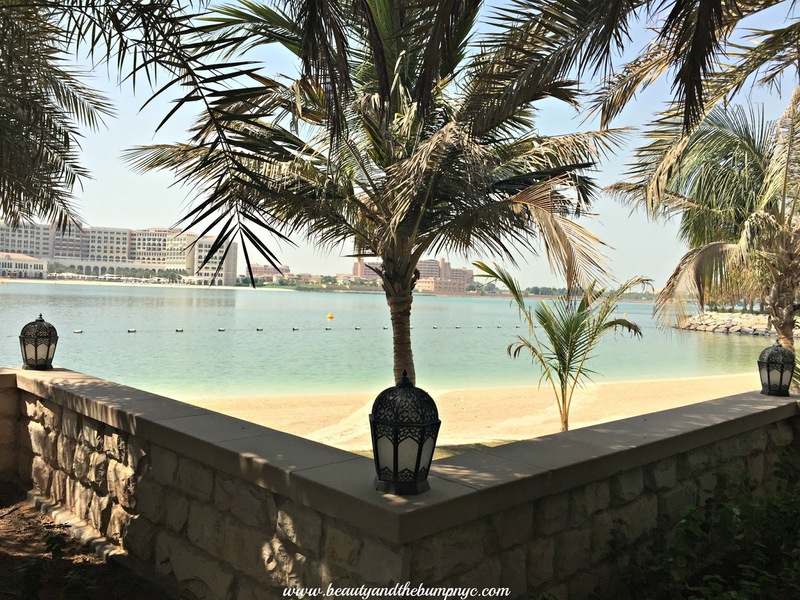 After a long day of touring Dubai, we drove nearly two hours to Abu Dhabi, arriving around midnight at the Shangri-La Qaryat Al Beri Hotel, which was the wrong place for us to check-in since we were staying at the Shangri-La Qaryat Al Beri Residences. 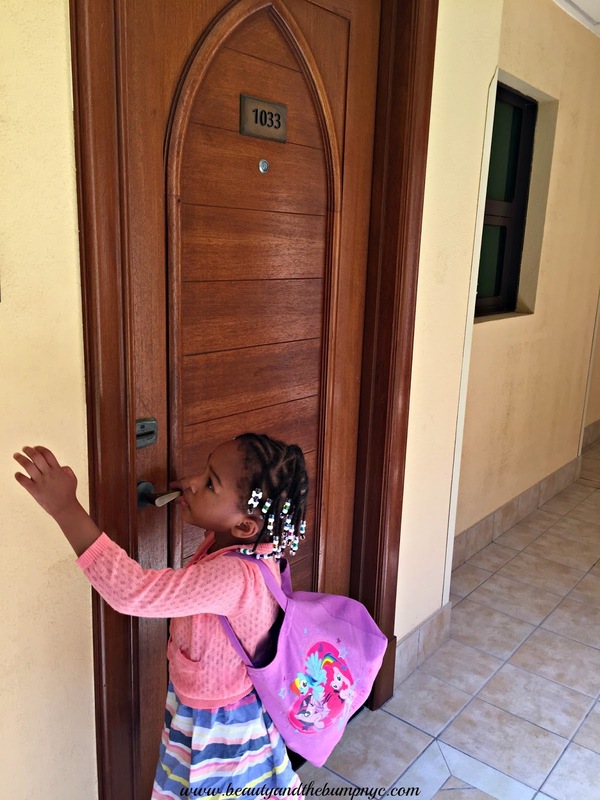 The hotel staff was accommodating, however, and had us (and our luggage) driven over to the Al Hur block, which is where we’d officially check into our studio apartment, room 1033, located in the Al Jeer complex. not to mention how immaculate was the room. The grounds were just as beautiful with its lush gardens, pools, waterways, and the views of the Sheikh Zayed Grand Mosque as it glowed in the night. Amazing! Our studio apartment was located on the lower level with a view of the garden and pools. This location was convenient for us, and any family with small children since we didn’t have to worry about stairs or an elevator with our child, and stroller, and who knows what else. The studio at the Shangri-La Qaryat Al Beri Residences was equipped with a full kitchen, living room, king bed, and a pretty decent-sized bathroom. The kitchen –I know other traveling parents can relate – was the best feature since it allowed us to cook at times, or re-heat food without calling on room service. We enjoyed eating our home cooked breakfast as a family sitting at the granite kitchen counter. Plus, our daughter no matter what must have warm strawberry milk when she wakes up in the mornings and being able to accommodate her needs without any mishaps made our lives a lot less stressful. Talking about making our lives less stressful, the Shangri-La complex has its very own Souk, a traditional Arabian market built in a modern setting offers a variety of shops and restaurants under one roof. There we shopped at the supermarket, picked up Kinder Surprise Eggs, got lattes from Starbucks, and picked up some fragrances from Khaltat Blends of Love. The Souk was about a 5-minute (or less) walk from our complex; however, hotel staff ‘s available to drive you there in one of the hotel’s club cars. It’s free, and just one call away. There were times I was seen walking the complex, and hotel staff member would stop and insist on driving me to my destination. Even though we didn’t stay at the main hotel, the Shangri-La Qaryat Al Beri Residences are still catered to by the Shangri-La Hotel staff. Our room was serviced daily, our rooms were cleaned, the dishes were washed and counters were cleaned, the linens were changed, fresh fruits and bottles of water were also provided daily. In the evenings we had turndown service that included the turning down of our bed linens, placing our slippers on each side of the bed, and having a glass and bottled water placed on the nightstand. Usually, when booking a hotel room, especially when I travel with our child, I make sure the room has a tub in which to bathe her. 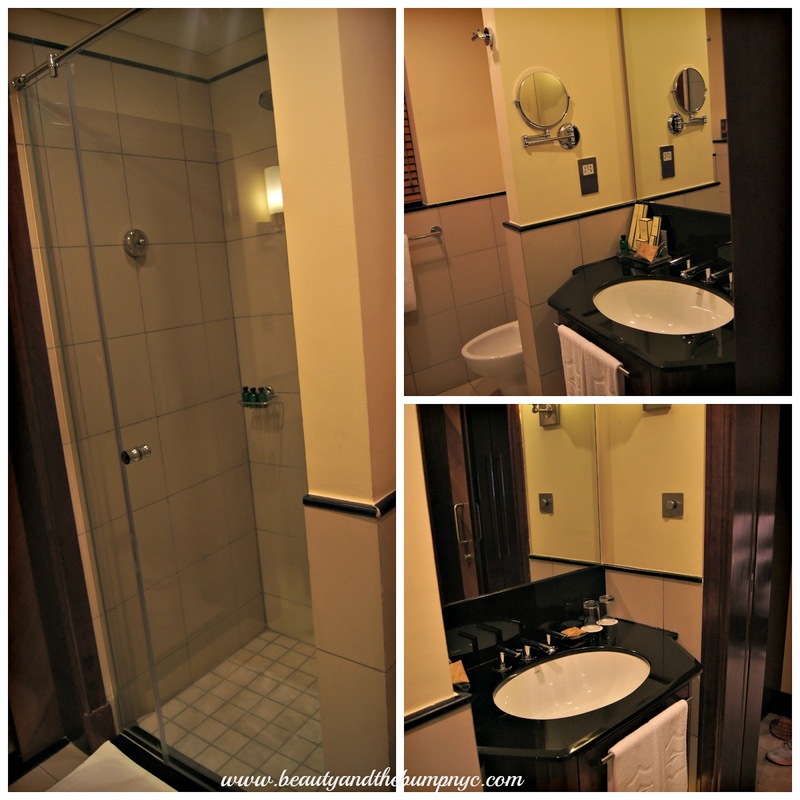 The Shangri-La Qaryat Al Beri Residences studio where we stayed only had a shower stall. Guess what? It didn’t matter. At this hotel, and during this trip, our daughter took her first shower, which continued throughout the trip. Boy, did she love taking them! She sang and danced, and at times, she didn’t want to get out. 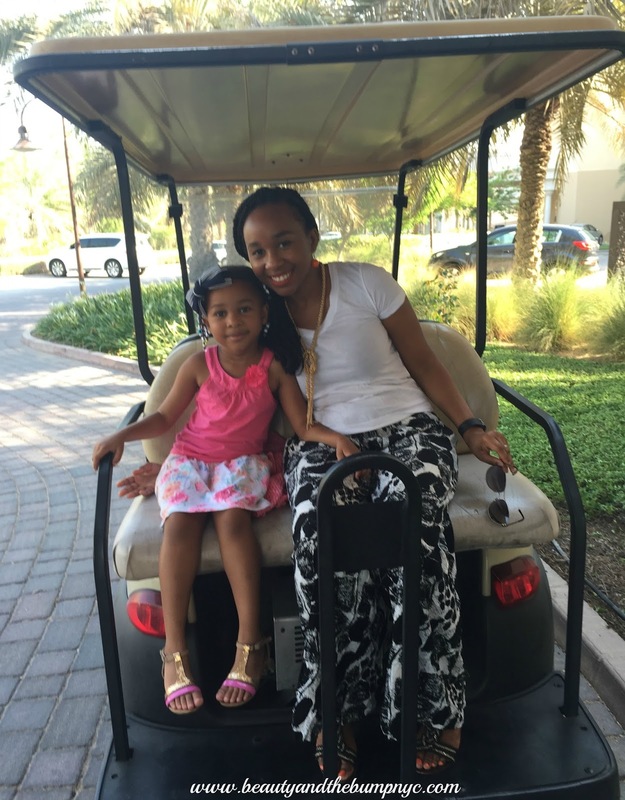 Overall, we enjoyed our stay at the #2-rated family hotel in Abu Dhabi, the Shangri-La Hotel Qaryat Al Beri. The Residences include 161 spacious serviced apartments ranging from studios to four-bedroom units. It’s the perfect place for families with small children looking for convenience and the comforts of home, all while enjoying living in luxury, even if it’s just for a little while. Whether as a family or on a romantic getaway my husband and I plan on making a return visit to this hotel. As a matter of fact, the Shangri-La Hotel is also the #2 Romantic Hotel in Abu Dhabi so you may want to consider it for your next trip couples trip to Abu Dhabi. 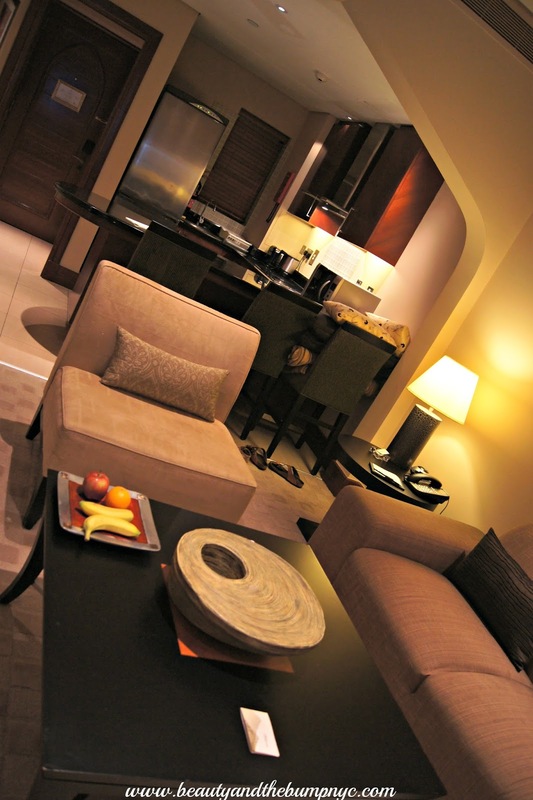 The average nightly rate at the Shangri-La Qaryat Al Beri Residences is $267 USD.